Clematis montana 'Broughton Star' is popular fast-growing and free-flowering climber, which flowers in May and June. While most varieties of this species have single flowers, 'Broughton Star' is notable for its semi-double flowers, which are a dusky pink with a darker vein in each petal. Given adequate support it is ideal for covering unsightly buildings, wall, and fences. Broughton Star was raised and named by Mr and Mrs Denny of Broughton, near Preston. 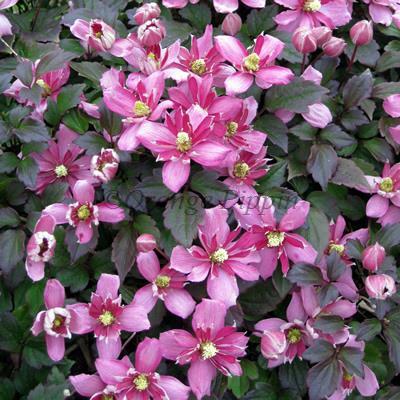 They set out to take the double-flowering characteristics of 'Mayleen' and introduce the intense pink colour of Clematis montana 'Picton's Variety'. Unlike some of the Clematis montana varieties, growth is compact, and little or no pruning is usually necessary with this variety. Although capable of reaching heights of up to 7m after 10 years or so, 4m-5m is more likely. 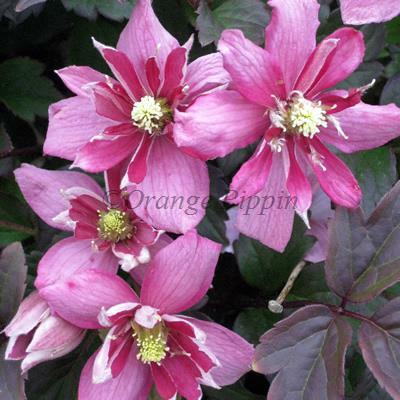 'Broughton Star' does best in full sun but will tolerate shade and can be planted in any aspect. It will require regular watering in the spring and summer for the first year or so until it gets established.